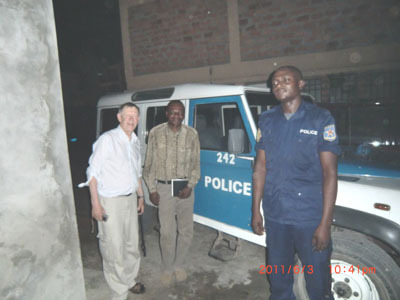 At 7.15 pm local time, we landed at N´djili International Airport in Kinshasa. The trip had gone according to plan. Even the airport seemed to be more orderly than last time. The only mistake was mine: I had put an incorrect time of arrival in our itinerary. And we forgot our filled-in declarations on the plane. Bernt realized this when we stood in line for passport examination. We explained our dilemma to the official who was in charge of the queue. He directed us to an office where we could fill in new declarations with the support of friendly Congolese airport staff. With our declarations we queued up for passport examination again, and we had no problems to get through. Then a guy called out ”Bernt”. He had our names on a piece of paper. He couldn´t pronounce Yngve – it´s difficult for anyone who doesn´t speak a Nordic language – and that´s why he just called out ”Bernt – Bernt – Bernt”. Two guys who we didn´t know, helped us find the way to the baggage claim. This time there were luggage carts instead of pushy baggage carriers, like last time. The two men gave us one cart each and we began waiting for the baggage to appear. While we were waiting, one of the men called Yapeco, who was waiting outside, on the phone. He wanted to talk to me on the phone, and then he wanted us to come outside and greet him and Gösta the Congolese way: with a handshake and three kisses on the cheeks. After that, we went inside through the police checkpoint, and got our baggage. If you have the right connections you can walk through water and fire. Yapeco is the mastermind. We had brought as much baggage as we possibly could, and it was somewhat overweight. When checking in, Bernt told the airport staff that we were going to compensate by far for the extra kilos on our way home. Then, we will only be carrying what we´ve got on. And we might even be a few kilos lighter ourselves. With a five dollar ”service fee”, all of our belongings passed through the baggage examination without complaints. Yapeco had found a large, blue and white Jeep with a driver for us. Soon, we realized that the car had police emblems on the sides, and that the driver Pierre was a police officer. We left the airport with silent sirens and blue lights off. Gösta explained to me that you must have highly placed connections to get a transport such as this. Yapeco wanted us to have a safe trip, and we got it. This is the first time I have gone anywhere in a police car. Our first stop was at Gösta´s house, where we met his wife Clary, their children Gösta and Gunnel and some other relatives. We had a nice chat, and were served tangerines, Fanta and biscuits. Then we went to the hotel, where our rooms were equipped with air-conditioning and had a wonderfully pleasant temperature. At our disposal, we had a bedroom with a double bed, and a comfortable TV room. We went to bed and fell asleep at once. At 4 am we were awakened by partying in a neighboring house. Then, there was a power failure and the air-conditioning died down. In other words, it was time for me to get up and write these lines, accompanied by an amazingly practical LED hurricane lantern. The partying quieted down by 5 am. Then, the church bells started ringing. Right now at 5.40 am, the hotel diesel generator is being started, dawn is breaking and some birds, which are sitting in a tree just outside my window, are performing their morning concert. Roligt att du skriver så utförligt om vad som händer! Dags att skaffa enklare namn? Allt gott under er vistelse!